Tackle many jobs—from the simple to the tough—with a heavy duty tie down strap built to handle up to 110 pounds of wrapping and securing. There are different lengths to suit your task, and the quick-grab end lets you connect multiple straps. Industrial-grade webbing is durable and flexible (and made in part from recycled plastic bottles) and hook and loop fasteners let you tie down and secure your stuff in one easy step. Dimensions: 4 ft. Strap: 6" x 1" x 2"; 6 ft. Strap: 7" x 1" x 3"; 8 ft. Strap: 7" x 1" x 4"
Weight: 4 ft. Strap: 0.17 lb. ; 6 ft. Strap: 0.24 lb. ; 8 ft. Strap: 0.31 lb. All around handy everyday item. Carry the in my truck. Always in need of something to tie down with. Purchased to use to keep big towels rolled into supports for my back and leg. It works and is comfortable. 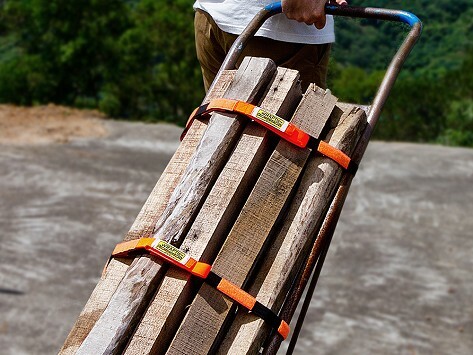 WRAPTIE™ heavy duty tie down strap easily moves between everyday and extra-tough jobs. From your bike or car to camping and moving, the super-strong strap comes in different lengths and can handle up to 110 pounds of whatever you want to secure. Which is pretty remarkable, considering it's partly made with recycled plastic bottles. Co-Founder Mark Blackburn is passionate about pollution. So he and fellow engineer Paul McNeill use recycled plastic bottles along with other durable new materials to make WRAPTIE™. The multi-purpose tie down strap is lightweight, a little stretchy, and crazy-strong. It creates a secure hold as it wraps, thanks to a fast-grab end that easily anchors, or can be used to connect two straps. All that wrapping and securing strength—made easy to use with hook and loop closures—rolls up neatly when the job is done.